Erivum Puliyum: Mini Cherry Pie (Step by Step Pics) | How to make pie crust from scratch?? 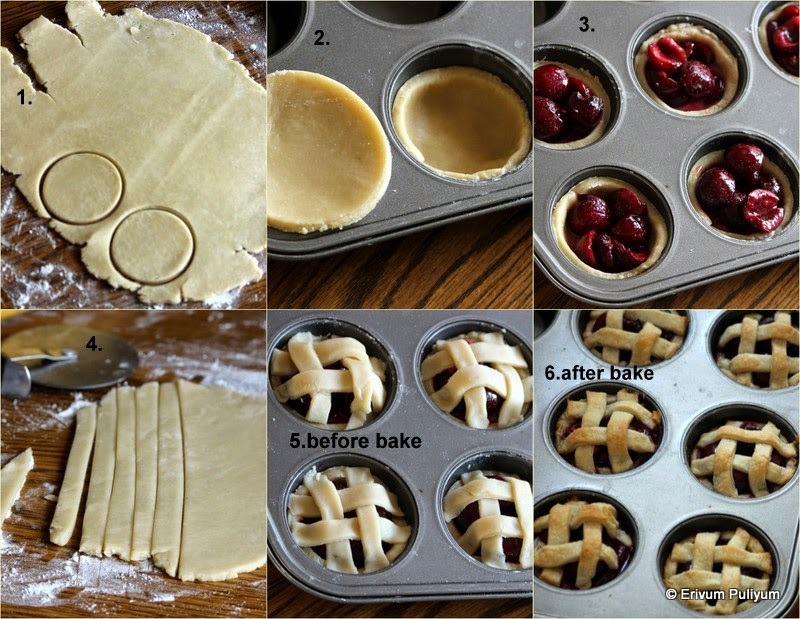 Mini Cherry Pie (Step by Step Pics) | How to make pie crust from scratch?? Cherries are in season now and so caught hold of these cuties to prepare this scrumptious pies.Pies/pastries are my kids favorite any time and this time,I tried out these mini versions with cherries.This is handy and can be easily served as individual portions.They liked (loved) this a lot and have demanded for more next time.These have a pastry like texture with the sweet cherry filling.I have tried a few recipes with cherry in the previous years(listed below).You can prepare the pie dough well in advance and can be freezed or refrigerated.This will make the work easier.Do give this a try and enjoy !! Sift the flour,salt and sugar until combined well.Add in the cubed butter and pulse if using a blender or food processor or using your hands,mix until the mixture is crumbly in texture.Pour water in the crumbled mixture so that the dough comes together when pinched(not a solid smooth ball).Transfer this onto a lightly floured surface and bring together to form a ball.Flatten this in a 5" circle and then cover with a cling wrap.Refrigerate for 30 minutes until its firm enough to roll out. 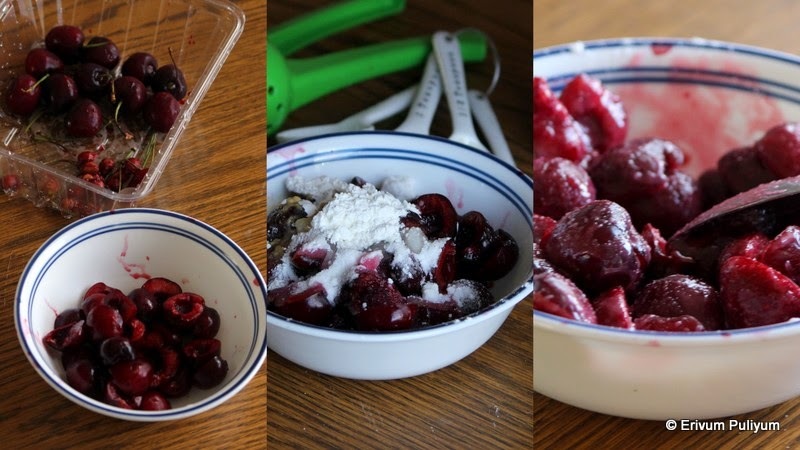 Wash and pit the cherries,cut in half.Mix the sugar,salt,corn starch,vanilla extract,lemon juice.Mix it well and let it sit for 10-15 minutes until its coated well. Pre heat oven to 400 degrees F and keep a muffins pan ready. Uncover the cling wrap and roll out the refrigerated dough on a lightly floured surface until 1/4 " thick.Using a 2 1/2 "-3" cookie cutter/lid ,cut out round shapes.Place these round shapes in the muffin cups by snuggling placing the edges.Place each cut out rounds in each cup.With the remaining dough,roll it again and cut out thin strips. Place a tbsp of filling in each and then using each strip place on top to give a cover/lattice. Place and bake at 400 degrees F for 25-30 mins.Cool down completely and then using a knife run through the edges and scoop out on a plate. Enjoy as a dessert or just like that !! *Double the quantity of pie crust dough and filling to makes 12 mini pies or you can make 1 large pie of 9" size. 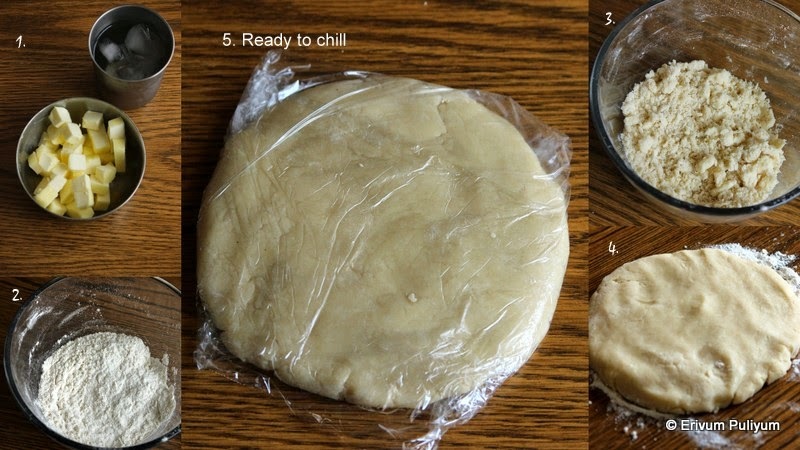 * You can prepare the pie dough and can freeze over a month.Thaw the dough in refrigerator overnight before using. They look so cute.. Yummy cherry pies..
Woow... So perfect and absolute deliciousness!!! Cant wait to try soon!!! Delicious and yummy cherry pies. Wow hard to resist to these cute pies, drooling here. I just can't control my mouth from getting flooded after seeing this...looks so cute and delish..
What a good looking tart! I want some please..
looks so yummy n i love cherries.. Cute and delicious pies, very tempting.. Perfectly done dear........ Pie looks super yumm! !